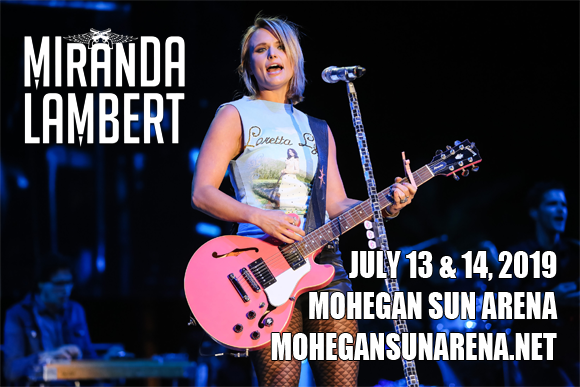 Miranda Lambert is coming to Mohegan Sun Arena on Saturday 14th September 2019 on her Roadside Bars and Pink Guitars Tour! The tour revival, which features the same name as a previous stint she embarked on ten years ago, will see a headlining set from the multi-award-winning country singer, plus support from Elle King, Pistol Annies & Caylee Hammack! One of country music's most notable female acts, American country music singer and songwriter Miranda Lambert first came to public prominence in 2003 when she came third place in the reality television talent competition Nashville Star. Lambert subsequently signed with Epic Records, and released her major-label debut studio album, Kerosene, in 2005. The album debuted at number one on the Billboard Chart and launched four top 40 singles, eventually gaining platinum certification from the RIAA. This set the scene for the rest of Lambert's career – her first six studio albums have all been certified platinum. Over the years, Lambert has won a variety of awards, including two Grammy Awards, twenty three Academy of Country Music Awards, five American Country Awards, seven CMT Music Awards and thirteen Country Music Association Awards, among others. The first woman to have won the Country Music Association Awards' Album of the Year twice, in 2018 Lambert also won the ACM Award for Female Vocalist of the Year for the ninth consecutive year, surpassing Reba McEntire in 2017 as the most awarded in the category.